So, here's a new thread about my free centaur morphs. You can find the old threads in the forum archive here and here. Unfortunately it seems impossible to log in into the old forum archive, so a lot of the images you posted cannot be seen. EDIT: Can I link to external pictures? Since you cannot switch off individual body parts of the Genesis figure in DAZ Studio 4, adamr001 created a pose file to achieve this with transmaps. http://daz.tall-tales-racing.com/resources/freebies/genesis/genesis_v4_centaur.zip Thank you very much! Keep in mind that you need the corresponding figures to use these morphs. Within the ZIP-file you will usually find an INJ-Pose to apply the morph to the MillHorse/MillFoal/Charger/MillBigCat plus a transmap with a MAT-Pose. Please read the instructions text-file included in the ZIP-file. You can link to external pictures, but only as a link, they don't display. You can however attach images, using the attach field under the type panel when you make a post. Up to 5 images can be attached. After adding each image link, click "preview and the add the 2nd link, and so on. THen post from the preview screen when you have added all the images you want to include. Image size is up to 2000x2000 pixels, which should resize to fit. THere can be some problem if you have an image in landscape format that is very wide compared to height, as the forum software resizes by the height reading only at the moment, so extra wide images can break forum formatting. Hurray !! So glad to see you Hemi !! It feels like it's been FOREVER !! OOOoooo I gettcha , RL can either be a joy or a royal pain ,but we gotta deal with it ,glad to see you back though. Thank you both. Love found me but it's not as easy as it could be. Sometimes it's painful. I am not willing to give up yet and I won't miss the last couple of months, as I learned a lot about me. "Love found me but it's not as easy as it could be." Hmmmmm, I don't know but in my personal experience love easy ,the relationships on the other hand are a lot of work, .......I'll keep my fingers crossed for ya. Thank you, I really need that at that point. Hi HEMI! LOVE?! 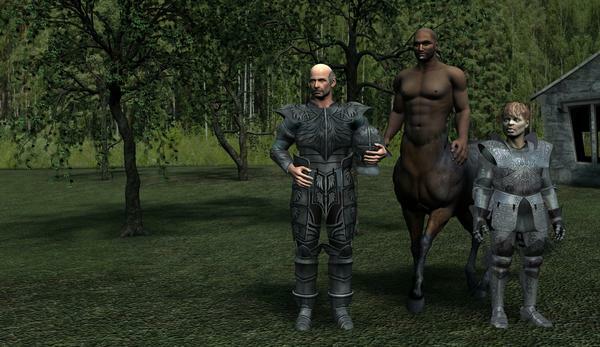 Man I better stick with the Centaurs. I'm divorced the 2nd time over 20 years ago now. ACK! I think I can find a Centauress pic newer than the demise of the old forum! Hurray !! McG is back ........ ya know I think you sure took long enough!! And your Winter centaur looks beatutimous!! Special note: ALL my Centaurs, male, female, with Gen3 and Gen4 people and MilHorse, MilFoal, MilBigCat . . . use HEMI426's morphs. I don't even consider using the others I've seen in the marketplaces here and elsewhere. Why? Being able to use all the various human figures with a number of the DAZ animals provides a high degree of characterization variety that is totally lacking in 'All That Other Stuff'. SO. HEMI's morphs and the DAZ Figures see all the use! Well if I'd known you were coming I'da backed a cake and had some hay brought in ........I know ,I know I'm getting silly ,had a long day at work. But I agree with you on Hemi's taurs they are great. I even got it to work well with Genesis. Nice render, but you´d better add more hair in certain areas, before some admin deletes your picture for modesty´s sake. Read forum TOS. How does the this go? I am trying this now, but I keep getting a leftover piece in the neck and the part where Vic4's hips are don't match up. Castellan ,Sometimes it takes a bit of fiddleing to get a good fit,once I do I usually lock the neck,and V4 hips so when I pose them,they don't go wandering apart. Can you post a screen shot to show what issues you are haveing?? 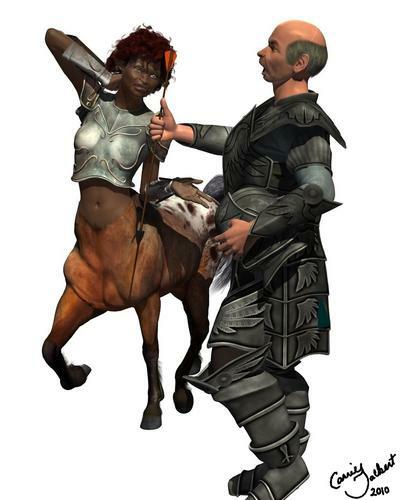 With the new horse http://www.daz3d.com/shop/horse/daz-horse-2 will there be new centaurs? I just got the new horse yesterday and tried it together with the DSON importer in Poser. Seems to work for me. Now I have to see if my old workflow to create morphs still works. Sometimes the hidden part neck2 has some side-side, bend or twist applied to it that also affects neck1. Select it and set these values to zero. Were you able to get the poser for genesis? Someone did make a centaur by geocrafting the horse and genesis together. Umm Hemi any luck with the horse2?? or did I kill the thread?? Lets hope more, post in here. Have not seen Hemi in a long time. Hope he is ok.
Heard from Hemi ,RL has him real busy but he says he is doing okay and will try to stop in when he can. 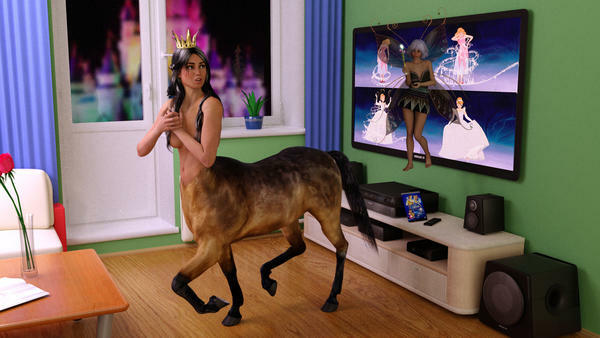 So until then I think we should post more centaur pictures!!! Glad he is doing well. lasserine that looks very cool ....is it a Reality or Lux render ? ?